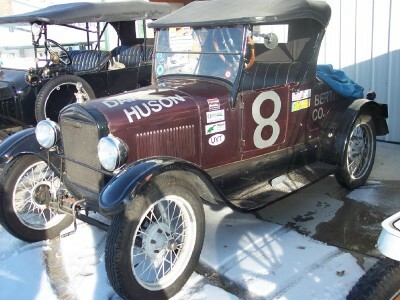 we have a 1917 T and we run it right off the battery without any coil boxes. So no magneto or anything. We just run battery cables to battery and have a toggle switch for the battery. However, my dad and I cannot go past about 60 to 90 miles or the battery will die and the fun is over! Therefore, I want to get him an alternator for it so it will charge the battery while running. I know its not original but he wants it and so do I. Therefore, my question is before i go and spend 250 on one from Snyders Ohio, what should i be looking for? I don't know much about engines and it would be great full if someone could give some insight or a link to something affordable. My uncle has a 24 or 25 T and he would install it for me. I just need the Part. Where do i start? Also, how many Amps? It has a 12 volt battery. and do i need any other accessories? Like a regulator? I see a bunch on google that are 12 volts that put out 35 to 40 amps for like 100 bucks. Is this correct? If your motor is a 1917 then there is no place for a generator on that motor but even if your motor is a later motor and has a place for a generator you will want to use a belt driven alternator so get a whole kit that has the belt, bracket, and alternator for driver side alternator mounting. The alternator should have a built in voltage regulator so that is no big deal. Remember that even a small alternator has a lot more amperage than you need. Start by figuring out WHERE you will mount the battery. If you try to use a very small battery such as a garden tractor battery then you will likely cook it by charging it too fast from the typical alternator. Even though you don't need a full size car battery for your lights, it probably is the way to go. You do not need one of the really expensive Optima batteries unless you need to mount the battery upside down or sideways. Forget the "deep cycle" ratings and just go buy yourself the cheapest full size car battery you can find. It will be overkill for your needs and I would buy whatever is on sale that will fit your location. Do put a fuse in the circuit to stop the battery from cooking your car. Figure about 10-15 amp fuse for headlights alone on 12V. Whatever alternator setup you go with - ask before you purchase it for a copy of the installation instructions. If they are not complete enough - don't buy it until you understand exactly how it is going to mount and what you need. If it all works OK you can omit the ammeter or voltmeter as a permanent fixture and just use your pocket VOM to test the installation. If installed properly there is no real reason to monitor it constantly so long as you have a fuse protection for catastrophic failure protection. I have to say this - if you purchased a full sized battery and charged it properly - you could drive for over 8 hours before that battery would go dead unless you have something in your car that is really not the correct item or not correctly wired. 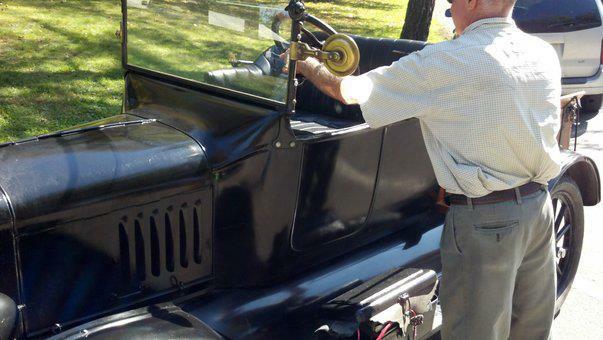 Many people with Model T's drive all week on a single battery and only charge it every few days. Being able to go only 90 miles tells me that you have something radically wrong and I would rather see you fix that first before you launch into an alternator only because you will have to fix that problem anyway and then you will realize you really didn't need the alternator setup in the first place. It is only an inconvenience to have to recharge the battery every couple of days for most folks and certainly not a mileage range limiter like it is for you. It is a 12 volt battery. I know that for sure. My dad tells me that it only gets about 90 miles before it dies (that is with headlights and brake light on). This i only know because he says so. There is room for the mount as he has in the past wished that he had one. And I almost forgot, the battery is not anywhere near the engine. We have one of those toolboxes on the driver's side insulated with rubber. We put the battery in there. So that is not taking up room. I am 28 and i could tear down a tractor without any problem, its just these tin lizzies i have no clue about. I could ask my uncle too, but this is supposed to be a surprise and someone might have a slip of the tongue. If i did say find an alternator and have a 12 volt battery, then 45 to 50 amps would be the correct amount? You said you run the car "without any coil boxes." How is your ignition set up? If you are not using four stock coils and a timer you must be using a modern coil and a distributor. Is the magneto in the car non-operative or was it removed? There might be an easier solution to your problem if all the facts are presented. I mean the box on the front. in side of the car above the pedals. by the fuel enrich toggle-er, that box. there are no coils in it. When you switch to battery or Magneto nothing happens as it is not connected. We have a switch for off and on. When on the battery is hot. When off the battery is off. you still have to choke it then crank it then pull spark and throttle down to start it up. Any alternator that will supply 40-50 amps is more than enough to do the job. But do yourself a favor and follow John Regen's advice and buy a kit. Otherwise you will be fabricating brackets, debating over a alternator with a built in regulator or not, pulleys, belts, wireing, etc, etc. A kit will have everything you need plus the instructions to set it up properly. BTW if you running ignition AND headlights AND taillights you may have as much as a 10 amp draw. Most average size car batteries are about 80 amp hours or so so if fully charged it should last at about 8 hours irregardless of the speed your traveling at. You say 90 miles, so assuming thats about 3 hours running time, somethings wrong. Probably as simple as your battery getting old and sulphated. Amp hours are greatly reduced under those conditions. The question remains - are you running a distributor on the car? There are also Hi Voltage magnetos that drive off the engine that might be on the car. I don't like advising people while being blindfolded. As Bud said - 90 mile range is something wrong. I strongly suggest you find out why that is before you try to put in a fix for anything. 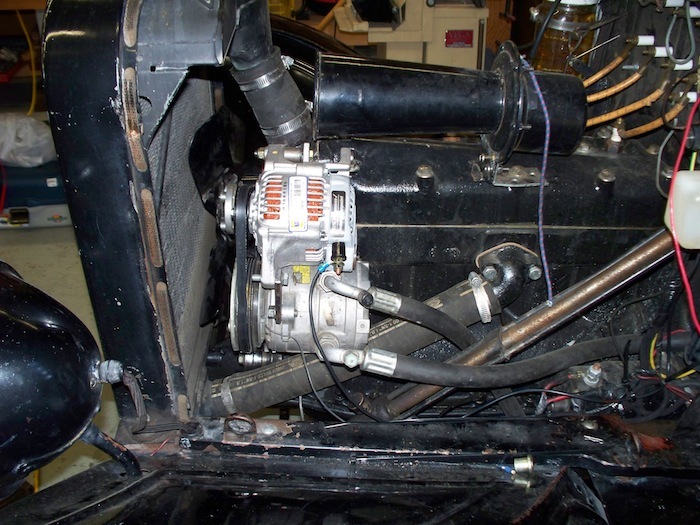 40-50 amp is way overkill for a model T and you will have to put in a wiring harness capable of withstanding that kind of juice if you install it. 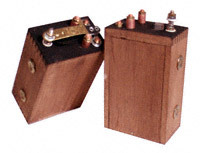 The stock model T is a 20 amp system and that is 6V. Typically when converting to 12V you need half that amount of current namely 10 amps but often the choice of coil and lights is not chosen with any respect for engineering concerns of the original car and that is when the troubles really start. Brian I'd agree with the rest and keep in mind the energy you get from an alternator isn't free. They take an amazing amount of HP especially if the battery is low. I would agree you should get more time out of your battery. I run stock ignition and can go a month or better and I drive a fair amount. An occasional battery charge is a small price to pay, I'll take the HP. I am not missing that part. Assuming the guy does not drive with his foot on the brake then the brake light is enough of an intermittent load that it does not figure into the power drain enough to warrant being an issue. 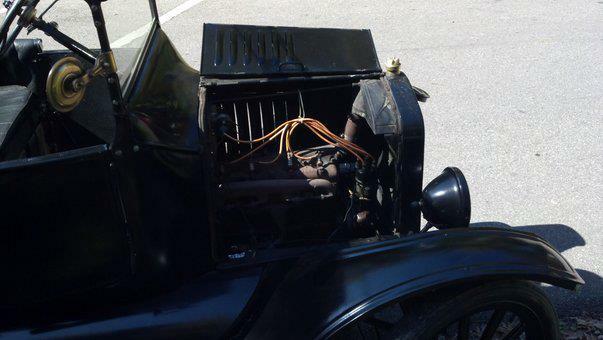 Since Model T headlights are 8-12 amps then 12V versions of the same lights would be 4-6 amps. We don't know yet whether he is running a distributor or high voltage magneto but only that he is not using stock magneto and coils. Then I would assume his coil is not more than about 4 or 5 amps. Thus total load would be 8- 11 amps. 80 amp hour battery is a typical automotive battery so do the math - you get about 10 hours running even assuming he never drives during the day time so needs his lights full time. If he does drive during the day then he should get about twice that long or over 20 hours of operation. I stand by the statement that something isn't right if he only gets 90 miles unless the car won't go over 9 miles an hour. Your assuming that the battery used will work as new. Brian said that they run it till it dies, as in a completely discharged battery. If they are using a standard auto battery as a (very) deep cycle battery it would not take many cycles to render the battery nearly unless and a drive time of 6 to 9 hours would be not out of line. If they are using a deep cycle battery they would be better off. Even then for the best battery life it is recommended not to discharge lower then 50% before charging. I agree with John. If he averaged 15MPH he'd hit 90 miles in 6 hours and at times he doesn't get 60 miles! If he is running lights during the day more options exist. Maybe he should consider daytime running lights..<smile> His bulbs would last longer..
Time for a 6V DRL? squint..Pretty dim. I should add that I installed an oil pump where the alternator could go. I have an A crank with inserted mains that require the oil pump. I too am puzzled by your 50 to 60 mile dead battery thing. No one that I know of uses a generator or alternator on the Montana 500. There are 7 pit stops on the 500 and starts with the battery and the morning starts. After the race they are driven out somewhere to a banquet with the headlights on and back again plus again using the starter. When the car is loaded in the morning to leave the starter is used again and after getting back home I can drive the car around home for a coule of weeks and all this time with all the starts never charge the battery. Even with all these starts and maybe 1,000 miles I use a 6 volt battery just fine. I will admit I use interstate batteries. The are are far superior to any other battery and cheaper in the long run because they WILL ALL LAST over ten years. We do on average about 25 to 30 mph. I have an app on my phone which says we can do top speed of 38. We are in North West PA. Farm land, back roads, sometimes gravel roads. So our average speed is about 20 to 25. Lots of hills to climb and bends to go around. As far as the distributer question goes. Yes. Behind the coil box that holds these is this mounted on the wall above the engine. And also, let me clarify, those 4 box coils are not installed. they are removed. Bad shot of engine. Ill try and find another, also, you can see the tool box on side where we hid the battery. I guess that was me, wow haha. Have you considered switching the car back to a stock ignition? If the magneto works, that might be a neater/cleaner solution than adding an alternator. I was thinking about this the other night and I think he was talking about the mag coils that he removed. Maybe we all got confused about which coils they were. this guy is indeed correct. that is what i was saying in the worst car language possible it seems. Using the term "mag coils" may cause confusion. 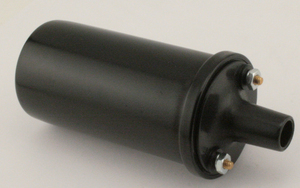 The four stock coils in the coil box are usually referred to as coils or ignition coils. The magneto in the powerplant has a field coil made up of individually wound coils. If your magneto is intact - both the field coil as well as the magnets on the flywheel, your magneto may still be operative. This would allow you to use the stock ignition - four coils and a timer. Instead of spending money on an alternator, you could spend it putting the car back to stock. You can also run a stock ignition set up with a battery if the magneto is inoperative. That option is out for now. My father has no interest in that at this time. Perhaps when I inherit it in another 30 years then i might think about going back to the way it was in 1917 but til then he has only spoken of interest in an alternator. I believe this is the part i need correct? Reason i ask is, i am getting conflicting reports from snyders and langs. snyders says mod ts only had gear alternators. langs clearly shows a belt alternator works because they have one for sale. Remember this is a 1917 T. Snyders say it has to be gear operated. I am totally confused. Up through 1918, there was no optioon for a gear driven generator on a Model T. From 1919 on, a gear driven generator was available. There are alternator conversions to place an alternator in the gear driven generator location on a 1919 or newer motor. It is a simpler conversion but does not apply in your case with your earlier motor. There are kits for a belt driven generator that can be used for any year Model T. This version typically includes a mounting bracket and a front pulley that has been modified for use with either a V belt or grooved flat belt. The kits are easier to use than making your own brackets and modifying the front pulley on your own. Of course if you have the time, tools and inclination you can likely do the bracket and pulley mods yourself. I did my own thing for brackets and pulley mods for my speedster because the kits wouldn't fit with my Fronty overhead valve head and I already had an alternator I could use. If I was doing this for a stock T, the kit would have been quicker and easier. Snyders and Langs both sell gear and belt driven alternator options. If want to purchase a belt driven alternator, you can order from any of the vendors or save a couple dollars by ordering from the folks that provide the kits at http://www.texastparts.com/mm5/merchant.mvc?Screen=PROD&Store_Code=TTP&Product_C ode=T5119EAlt-12&Category_Code= Texas T Parts charges $264 for the kit. L.D. Becker Antique Auto Electric has an ad in the Vintage Ford magazine for a belt driven kit with alternator, bracket, belt and pulley for $145. They don't show a web site but their phone # is (419) 668-5986 or (419) 663-5122. Snyder guy is confused or doesn't know about belt driven versus gear driven alternators. Lang gave you correct info. You cannot add a gear driven alternator to a T that has no place to mount it. The mounting for a gear driven generator or alternator was not available until 1919. The gear driven alternators replace the gear driven generators which were available on T's starting in 1919 and not before that. Cars earlier than that MUST use a belt driven alternator. The fact is that the gear driven alternator is a marginal setup anyway for lack of cooling air available to it since alternators unlike generators need a source of forced air for cooling. The alternators used on modern cars have a fan as part of the pulley to force air over the windings and diodes in the alternator and also have the ends open to allow air in an out. Without that forced cooling your alternator will not put out anywhere near its wattage rating without overheating. If you intend to put an alternator on your T - go with belt driven and buy a kit that includes brackets, belts, and all pulleys necessary. I have no ties to anyone who sells alternators and frankly feel that putting an alternator on a T is like putting a blown Hemi V8 on your lawn mower. I have no idea why anyone would think they need a 750 watt source of electrical power on a Model T for any purpose other than the usual and always erroneous "more must be better" reason. Ehh, we want to power lights and brake light. We want to go on long trips without recharging. I am not a purist. I put a klaxon horn on it too and its not correct with the year. Don't hate the player, hate the game. I'd like John Regan to chime in here to answer a question I have. John, if he is using a 15-20 amp fuse and conditions call for an abundance of current from the alternator, if the current exceeds the amp rating of the fuse will this blow the fuse? The alternator will supply all the current that is demanded upon it up to its rated capacity. It's like a wall plug. Like the Krell labs in Forbidden Planet. If you exceed the amp rating it will blow. The alternator will supply 1 Amp if the devices it powers demand it, it will supply 100 amps if it is capable if the devises call for it. Yes Mike, my thought was that we install a fuse to protect the vehicle if there is a wiring fault. Then we add an alternator that is capable of at least 35 amps. If we happen to leave the lights on or some similar problem, and the car starts the alternator kicks in at full charge and overloads our 15-25 amp fuse we put in for protection. Am I on the right track? Doug I see what you mean. I would wire the alternator directly to the battery via the amp gauge and fuse just it. I would then feed the rest of the car from the battery through an appropriate fuse. The starter switch is a good location. That way if the battery demands say 40 amps that would be a direct feed. I find the amp gauge and the wiring update to be as problematic as the alternator. I would run an analog volt meter and retire the amp gauge which tells you very little, this way you can wire the alt direct with little worry and I would use a fuseable link and overrate it slightly above the alts capability. BTW Doug, nice looking family and the car don't look bad too!! Your are catching on. Unless you fuse the output of the alternator itself with a fuse to protect the wiring - you cannot be sure that a 25 amp fuse will protect your car wiring if an alternate path than the battery is where the load current goes. It is possible that the battery won't draw any of the 35 amps but something else MIGHT. This is the problem with using a device in a system that has more power than the system can stand. You cannot fuse the battery and then assume all is well unless you know exactly where the short is going to happen at. If you know that then why not prevent it in the first place. All of the info I gave on the alternator is correct to the best of my knowledge of what he is doing but I confess I don't know for sure what all he is doing since his 25 MPH range of only 90 miles is suspect. The idea that a battery not new should perform less than a new battery is true somewhat but a used battery is pretty useless when it has less than even 30% of its capacity missing so what is the point? The range is more than 100% off from what I would expect. Some info here is just not passing the smell test for me. I of course don't see the need for the whole direction this is all going but it isn't my decision to make. I accept that and just answer tech questions now but don't really have enough info on the main questions being asked. This response is for Doug's thoughts since he is correct in his concerns. Think about what he is saying since this issue is very often overlooked in alternator conversions. If you are going to convert - do it right so it is safe.